How do I get access to an app that is not yet available in our country? It always takes ages before an app is offered in our region, is there a workaround? How do you get all the latest (free) apps? This blog will provide an answer to these frequently asked questions. How to set it up in 10 steps? Open iTunes and go to the App Store. Scroll down to the bottom of the page and click on the flag (right hand corner). Select the country you want (e.g. USA) by clicking on the right flag. You are now in the right iTunes Store. If you were signed in, you will notice you automatically are logged out. Now search for the App you are looking for (e.g. CardMunch). Click on the “Free” button to download it. A popup box appears and asks for your Apple ID. Choose the “Create Apple ID” button. Click “Continue” and Accept the Terms & Conditions by clicking the “Agree” button. Provide the Apple ID details in the form. Provide a Payment Method, choose “None” and fill in an address. How do you find an address? I rent one using MyUS.com. Of course, you can also Google one, but that might not be the best way forward. Wait for the confirmation email to arrive, confirm it and download your app straightaway! Now you can enjoy a truckload of apps from this extra iTunes Store in the country of your choice. It goes without saying that this is probably the easiest way, but limited to free apps. Start with the free ones, I might share the next steps later for paid apps. What happens if your computer battery dies on you? Do you still carry a pen and paper? What if you could write on your laptop? No, really, write on it, like on a whiteboard! To be honest, I am using a Genius Shortcut called TheDrawTop on mine. It is like having a mini-whiteboard on your laptop computer (iPad, iPhone, etc. too! ), where you can make notes. But is that the only thing? 1. When your battery runs out of power, but you still want to take notes. 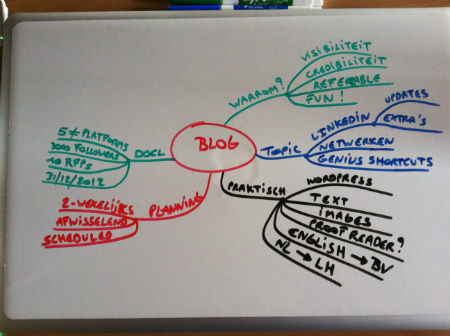 Start writing on your personal whiteboard. 2. When you want to mindmap or draw something quickly (and you don’t want to wait for the right app(lication) to load. Just write on top of your device. 3. 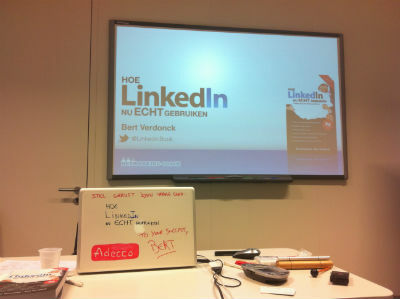 When participating in a meeting, write your name on it, so people know who you are. 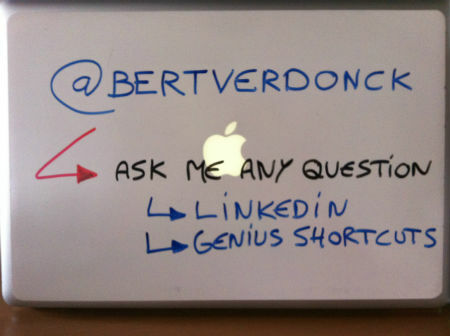 At conferences I also write my Twitterhandle (@BertVerdonck) on it. 4. When you are giving a presentation, welcome all participants and invite them to ask questions. I also draw our customers’ logo on it, but granted not everyone does that. You could also draw a graph on it if there is not a flipover or other whiteboard available. 1. You take out your smartphone and you take a (clear) picture of your drawing, mindmap or whatever you wrote. 3. You synchronize your smartphone with your laptop later on (when you have power again). This way you have digitized your notes and drawings! 3. Download it again as text or in whatever format you want it! By the way, if you want to go cheap (TheDrawTop starts at 12 $) and do it yourself, you can also buy the adhesive whiteboard material at your office supplier. Of course, you still need to cut it at the exact dimensions of your laptop. As you know, I always choose the easy way. TheDrawTop asks you for the type of your laptop (or other device) and delivers it made to order for your computer. That’s the way I like it! Tip: As an extra TheDrawTop also includes a set of 4 markers and a microfiber eraser cloth. When I heard the word “obsolescence” for the first time I liked it immediately. Now why would I write about this? Well, a number of obsolete products are on the way back. Want an example? The USB Record Player. Ok, I have to admit. I still have a number of records. Sure enough, I hardly play them…in this era of MP3 and iTunes. Now, I discovered something else. A USB Typewriter. That’s right! Lovers of the look, feel, and quality of old fashioned manual typewriters can now use them as keyboards for any USB-capable computer, such as a PC, Mac, or even iPad! You can either buy a refurbished one or Do-It-Yourself. Personally, I find it cool to have a classic typewriter as a keyboard for an iPad2 🙂 I haven’t tried it yet, but it seems great, don’t you think? Everyone is looking for savings, right? Some go really far to achieve it, while others are looking for a Genius Shortcut to get similar results. When it comes to printing, which savings did you try so far? I discovered the EcoFont (Dutch indeed :-)), you know a font with holes in it to save on ink. Personally, I see that you make a statement with it, but frankly I don’t like it! With my background in communication, I support building your brand in a consistent way. And the EcoFont does not fit mine. So, I did some research on fonts and discovered a great experiment by Matt Robinson. A selection of the most commonly used typefaces were compared for how economical they are with the amount of ink which they use at the same point size. Large scale renditions of the typefaces were drawn out with ballpoint pens, allowing the remaining ink levels to display the ink efficiency of each typeface. a crowded elevator. You need to go to the 14th floor ASAP. You dream of going directly to your floor instead of stopping for everyone else’s. Wouldn’t that be just great? Impolite, but great, right? Well, there is a Genius Shortcut that you can use in most elevators. Yes, I know! How come so few people actually know about this? Why does it work? While some elevators require a key, others are configured to get into “Express Mode” when the “close doors”-button and one of the floor-buttons are pressed simultaneously. Most paramedics know this (or should! ), so they get faster to the right floor in case of an emergency. So, I invite you to give it a try! You are currently browsing the archives for the lifehacking category.